Plantar Fasciitis is a foot condition that causes heel pain and arch pain. The pain is caused by stress on plantar fascia (a ligament that stretches from heel to toes). 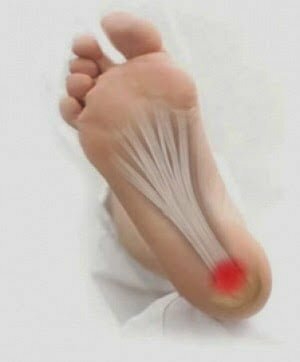 The pain is worst after a period of rest (for example in the morning time you take your first steps after getting out of bed the pain is very sharp in heels and may spread around the entire bottom of the feet). Most people have pain in one foot but many suffer from Plantar Fasciitis in both feet. Is Plantar Fasciitis common in India? With obesity on the rise, Plantar Fasciitis is becoming one of the fastest growing pain conditions. Many people who suffer from Foot pain do not realize that the pain is treatable in most cases and manageable in all the rest. The causes of Plantar Fasciitis are not fully understood. Obesity, wearing non-supportive footwear and extending period of standing, walking and running can cause the pain to start. This is why Plantar Fasciitis is sometimes called a runners disease. People with flat feet suffer more often than others. The condition sometimes is acoompanied by heel spurs too. Ignoring Plantar Fasciitis can cause complications including severe chronic pain in feet. If you have heel pain, chances are you will change the way you walk to avoid pressure on the hurting foot. This change in the gait may lead to back pain, hip pain and knee pain. What treatment options do you have if you suffer from Plantar Fasciitis? With simple treatment and care, most cases resolve with time. As the first steps, the doctor may advice people to take rest, reduce exercising and taking pain medication (NSAIDs). If the pain does not go down, here are a few other treatment options available. Exercise: Stretching the plantar fascia helps in heel pain. It relieves stress from the ligament and allows it to become strong. The stretching exercises should be done before getting out of bed. The exercises include toe stretches, towel curls and calf stretches. Ice Massage: Rolling your foot on a iced bottle of water helps soothe the plantar fascia ligament. It eases the pain temporarily. You should limit the iced bottle massages to 10-15 minutes. Compression: Wearing compression socks is another way of reducing the pain. Compression socks offer pain relief that lasts much longer than Ice massage. With the compression socks, you can get support for your feet that is essential when you have Plantar Fasciitis pain. You can wear sleeves style compression socks to bed overnight which can help reduce morning pain. Compression socks are now available for office wear and sports wear. Many athletes prefer to wear compression socks while jogging and running to ensure extra support for the feet. Some athlete compression socks are designed to improve athletic performance. Night Splints: Very commonly used to treat morning symptoms of heel pain and plantar fasciitis. Night splints keep the feet stretched in a way that the toes are pointing up. The Plantar Fascia gets a stretch while you wear the night splints. It is another way to combat severe morning heel pain. You can wear night splints every night for many months. Orthotic Insoles and Orthotic Shoe inserts: Inserts and Insoles are designed to give support at the arches and cushion at the heels. They are supposed to provide pain relief. You have to make sure you get the right insoles that match your feet size and shape. If you have the correctly designed insoles, you can give your feet the balance, support and cushioning that your feet need in Plantar Fasciitis. Change your worn-out shoes: If your shoes are worn out, change them. Worn out shoes do not offer heel support that you need. Buy shoes with strong cushion support and moderate heel. Avoid high heel shoes till the pain reduces. Do not walk barefoot and avoid walking on hard surfaces. Reduce weight: In many cases, Plantar Fasciitis is caused by increased body weight. Your feet may not be strong enough to handle your increased weight. If you reduce your weight even 10%, your feet will have 10% less stress and load on them. Lose weight through healthy ways. Weight loss may not be the sure-shot solution to Plantar Fasciitis but it will surely reduce the pain in your feet. With time and determination, you can manage the Plantar Fasciitis pain and eventually live a life of mobility, activity and movement. Do not let Plantar Fasciitis deter you. Good luck!